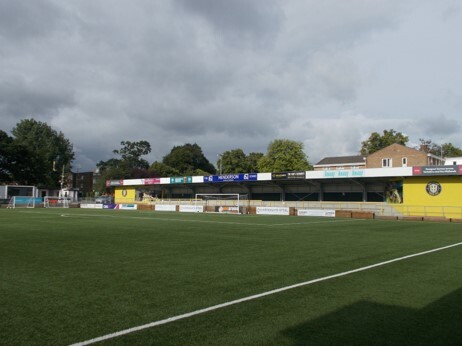 Harrogate Town took a big step towards securing a play off place when they came from behind to defeat Havant and Waterlooville 2-1 at Westleigh Park,Havant. Town made three changes to their starting line up with Liam Kitching,George Thomson and Michael Woods replacing Ryan Fallowfield,Mark Beck and Liam Agnew. The Hawks,playing with the wind and slope at their backs,made the early running,and James Belshaw had to make an excellent save to turn a shot from Alfie Rutherford over the bar. Who then made no mistake from the spot. Town began to force their way into the game and a Jack Muldoon shot hit the upright before Kelvin Langmead’s header hit one of his own players and diverted wide. With three minutes left in the half,Town were gifted an equaliser when Ed Harris headed a cross back over his keeper,Laurence Bilboe,who had advanced from his goal.Although Bilboe raced back and scooped the ball off the line,Woods followed up to score from close range. With the elements in their favour,Town dominated the second period. Muldoon should have scored in the first minute when he was sent through by Agnew’s pass,but he lobbed well over the bar with Bilboe stranded in no man’s land. Callum Howe then pushed forward to head over the top and Woods volleyed a Warren Burrell centre high and wide as Town pressed for all three points. Next,Joe Leesley was off target when he latched on to a Josh Falkingham pass,but with nine minutes left the all important goal arrived. A superb ball down the left from Kitching found Muldoon and his chip from the bye line was glanced into the net by Thomson’s header. So Town retain sixth position as they head into the last four vital matches. Havant &Waterlooville, Bilboe,Williams,Harris,Fogden(Jallah 66)Paterson(Quigley 66),Rose,McNamara,Rutherford,Cordner,Donovan,Paul(Lewis 82).